This past weekend we finally had enough free time to go see Iron Man 3. I don't read comic books so I don't get quite as excited by all the superhero movies and superhero connections as SP, but I do enjoy action movies. Fights! Blowing stuff up! Mindless & pointless destruction! I much prefer that kind of movie to some dopey, predictable romantic comedy. Puke. Just one of the reasons SP loves me: I don't do 'chick flicks.' I can't tell you how many times in the past few months I've flipped on the TV and, while waiting for him to join me, gotten sucked into a Jason Bourne movie, or Thor, or Mission Impossible Ghost Protocol, or Battleship. Yes, even Battleship. How can you not like a movie with super dumb dialog and a plot line that involves bringing a WWII battleship back to life to defeat the super advanced aliens?!!! SP & T both ordered beer. 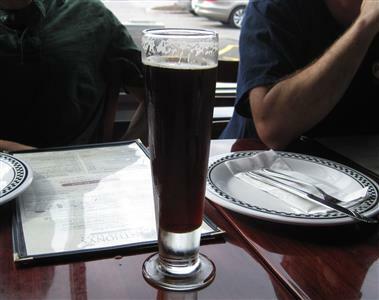 I forget what T got, but SP chose Fat Gary's Brown Ale on tap. I wanted iced tea, but apparently this is another place that cannot be bothered to brew fresh iced tea, instead offering bottled iced tea. This bugs me. A lot. Just like places that serve soda in a can or bottle, which this places does. I am sure they have some perfectly logical reasons but frankly, I think it's lazy. And a way to get more money out of a consumer (gouge, maybe? ), like glasses of wine that cost half as much as the bottle in the liquor store or bottles of wine with a 400% mark up. Our server brought us a sample of their wings. I was confused at first because all I saw was a huge mound of sauteed onions. There were 4 wings underneath the onion mound. SP & T liked the wings. I thought they were OK, but then again, I do not really like wings. Mostly, I think they're too messy and too much work for the payoff. A little spice flavor, a little salt flavor, just your basic wings. We ordered two pizzas. One was a 12 inch pizza with prosciutto. The other was the 12 inch Eggplant Marino Pizza - thinly sliced eggplant, tomato sauce, romano, and fresh basil. I'm a little torn here. It was OK pizza. Pizza is largely a matter of personal preference (thick or thin crust, amount/flavor of tomato sauce, toppings, etc.). This was thin, but not as thin as at Piccolo Forno or Cucina Bella or Picasso Pizza or Il Pizzaiolo. The edges were a little too charred for me. The tomato sauce is sweet. The middle of the eggplant pizza was pretty wet, so it was soggy and droopy and fell apart. My problem is the quality to cost ratio. There is nothing wrong or gross about the pizza, it is definitely decent, but compared to the quality at the aforementioned places and the cost at each place, Anthony's would not be my first choice. It would be my last choice. For two 12 inch pizzas (6 slices each), it cost about $33. The other $10 was for two beers, then tax and tip. We had just 3 pieces leftover. Another problem - I didn't notice it as I was eating it, but the pizza was some of the saltiest, most dehydrating pizza I've ever eaten. I drank my entire glass of water. Then I drank 3/4 a bottle water on the 2 minute car ride home. Then for the rest of the evening, I kept drinking water, convinced that it would wash the salt out of me. Nope. All the water just made me feel uncomfortably bloated, made me make many trips to the bathroom, and made me wonder how much water I can ingest before I die (remember the story from several years ago about the woman who was in a water drinking contest and died because she drank too much water?). I was still thirsty the next day. Back to Anthony's. Our server was very friendly and made suggestions. Anthony's was definitely pushing their wings. Servers brought free samples to each table and then made a return trip to emphasize how good the wings are and now you want to order some, right? To sum up, it's an OK place to eat after a movie at Robinson Cinemark at Settlers Ridge, especially if you don't feel like driving somewhere else, but if you haven't just seen a movie and you're looking for a tasty pizza dinner, I'd suggest elsewhere.